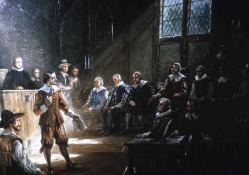 The Virginia House of Burgesses. Due to his success in the Virginia state legislature, John Marshall soon was offered high positions in the federal government. President Washington asked him to be Attorney General in 1795 and the minister to France in 1796. Marshall turned both of the offers down because of a financial situation that required him to stay in Virginia. In 1797, President John Adams appointed John Marshall to go on a diplomatic mission to France to ease tensions between France and the United States. Marshall accepted the offer and what occurred during that mission became known as the XYZ Affair (Click on the link to learn more). After returning from the mission, John Marshall's popularity increased, especially among Federalists, due to his actions during the XYZ Affair. With this newfound popularity and along with the advocacy of Washington, Marshall ran for office and was elected to the House of Representatives in 1799. During his brief time in office, Marshall became the leader of the Moderate Federalists. He also supported the policies of President Adams, a fellow Federalist. At this time, Adams was becoming more unpopular among the people and profited from Marshall's endorsement. In return, Adams, wary of disloyal cabinet members, chose John Marshall to become Secretary of State in 1800. Because the Continental Army was a not a professional army, John Marshall was only required to serve for a few months each year. 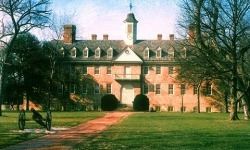 In 1780, during his free time, Marshall attended a six week series of lectures on law from George Wythe at the College of William and Mary. The same year, Marshall was admitted to the Virginia Bar and started his own practice in Richmond. John Marshall was charismatic, well-spoken, and intelligent. This allowed him to become a very good lawyer, despite his lack of formal education. Marshall's practice was also very successful and he became one of the most prominent lawyers in Richmond. Marshall was also eminent in state politics. He was elected to the Virginia House of Burgesses for the first time in 1782 and went on to several more terms. He also served in Virginia's Council of State. Because of his nationalistic views, John Marshall was part of the Federalist party, which called for a strong central government. While part of the state legislature, Marshall stuck to his beliefs and voted for measures that strengthened federal power. These views put him at odds with Republicans, who wanted more state power. Ironically, one of his adversary was his own distant relative, Thomas Jefferson. In 1788, John Marshall was given the opportunity to exercise his Federalist ideals when he was elected as a delegate from Virginia to the C0nstitutional Convention. There, Marshall argued in favor the creation of the Supreme Court and ratified the Constitution.